If the name Hywel Evans rings a bell, it may be because you saw the fantastic pictures of his hand-finished Julius Pettersson Knife that we posted on our blog earlier this year. 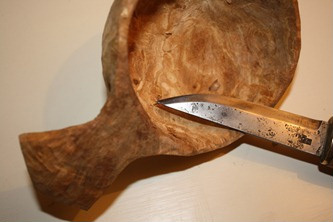 Well, Hywel has been busy again, putting his new knife to use in carving his very own Kuksa cup. 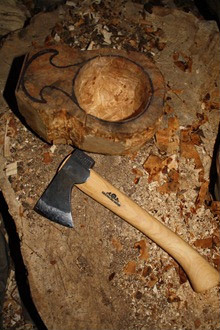 This entry was posted in Bushcraft Clothing & Equipment, Bushcraft Tips & Guides, Customer Posts on August 9, 2011 by Woodlore Team. 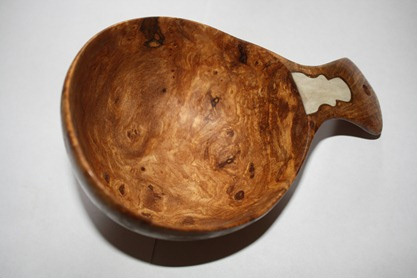 wonderfull kuksa mate,i am very impressed,would you consider adding your pictures to the webs largest collection of kuksa pictures? P L E A S E!!!!!! Oh, After my first original post I sent a second complimenting your craftmanship. You do very good work! For some reason the moderators did no let it through. I also wasn’t writing to ream you out. I just wanted to clarify that cutting a burl from a tree isnt like removing a branch. Otherwise, the idea might get catchy. I understand that the tree was going to be removed. I dont have a problem with that…Ive cut down hundreds of trees. When a tree is injured on the trunk the first reaction is for the tree to create a sort of chemical resistance to whatever infection may be present in the environment. A simple example of this is when you see where a branch once grew from a tree an died many years ago. In the case of my example the branch may have rotted away and the area has not yet developed enough new wood to cover over the area yet. If you look at the area there will be a tunnel or rotten stub where the branch used to be. The strongest chemical barier to disease in most trees is generally formed here. Between a branch and trunk. If you were now to cut the tree in half down the length, depending on the size of the branch, if it was young for instance, the tree would likely have no further signs of decay. Whatever wood that used to be the branch from the day it was first formed is however subject to decay. Now, when you cut into a tree’s side you expose the trunk wood. Cutting off a 1foot diameter burl is effectively the exact same as taking a chainsaw and sawing the same diameter slab off of any other part of the tree. The first things that the tree will do to resist disease will be to create chemical barriers to prevent infection from entering directly into the trees core and also from traveling up and down the trunk. In the case of a large injury these barriers are only temporarly effective. They slow decay as the tree rapidly forms new wood in the area of the injury. This new wood is an attempt by the tree to first cover the injury and seconly to thicken the trunk in the area of the injury. As decay sets in if the tree cannot stop the spread of infection it will eventually quaranteen off all wood that has growm to form the trunk up until the moment of injury. If you look in a hollow tree and scrape off the dead wood till you get to living tissue ,thelayer , unless if has been subject to further injury will be of the same growth ring. In the case of an oak tree which has very high natural resistance to disease this is a very slow process and is not likely to cause the tree to fail. Birch on the other hand are a different sort of tree. They dont respond well to injury and the wood tends to decay very rapidly. A large wound to the side of a birch is generally a death sentence. I have a plot of forested acreage here in Ontario and have carefully removed small burls (no larger than 8-10″ in diameter)from a few trees over the years. To date, none have succumbed to their injuries. Perhaps maples are of a resilient nature. Still, agreed, harvesting from a tree that is dead or dying is certainly the preferable choice. To start with Jeff, I think you are talking about exposure of the heart wood, which in fact has most of the xylem vessels (carry water) in it. Exposure of the sap wood (phloem vessels) in due fact would probably allow more infection to enter the tree as more sugars are present for the organisms to flourish on. Burls can often occur due to a parasitic invasion of bacteria and fungi themselves, and the heart wood doesn’t usually grow through to the burl, in due case stripping a piece of bark of the tree would probably have the same effect so yes there is a risk but it’s not necessarily going to die. As far as “barrier off all the trunk wood” I don’t follow as this doesn’t make much sense to me why the tree would do that. Pathogens possibly, sapogens I’m not sure, I do believe sapogens are what they use to repair skin damage in ointments as they have a tendency to help repair cells. I would be interested also to hear what chemical barriers are present, as I m studying biology at the moment. In any case the tree was going to be cut anyway. If anyone can please tell me biologically why a burl is different I would be very grateful as I would like to learn. Hywel, what is inside the kuksa that you are boiling? Why is it white? Taking a burl off a tree is not at all like taking a branch off. The tree has the ability to create chemical barriers around the branch to prevent pathogens and sapogens from entering and decaying the trunkwood. The most effectice of these barriers are at junctions where new branches are formed from the rest of the tree and are less effectice as the branch gets bigger. The area where you sawed off the burl has the least effective of these chemical barriers and will eventually barrier off all of the trunk wood from the time of injury, allowing the tree to hollow out and become more likely to come down in a wind. Birch are especially susceptible to injury and as a resilt removing the burl has almost guaranteed that that tree will die within the next few years. In my opinion taking small burls doesn’t really harm the tree as they aren’t much different from taking large branches off, however with every cut made to a tree, there is always a risk. The tree I got this burl from was on a farmers land, who was going to cut it down anyway, probably for firewood, and I asked his permission to remove the burl. The burl I obtained was a very large one, and an incredibly rare occurrence being about a foot and a half across, I must note this was a incredibly rare find. I didn’t have an exact boiling time for the cup as I usually don’t record things by time, however I took this cup out when it felt dry, and was incrusted with salt on the outside. 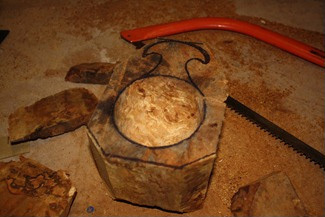 My advice when carving with burl wood would be to always carve it green, and always leave a lot of wood on the cup until the definite shape has been obtained. Was the tree still alive when you cut the burr off? A thing of beauty. Well done. That is beautiful. I love the reindeer antler insert on the handle – it lifts a lovely object to the realms of the stunning. Finding a burl is my next quest; it seems that birch ones of the right size are quite hard to come by. 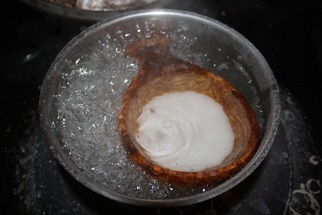 For how long did you boil it in salted water? gorgeous mate,well done very tastfull. Beautiful Hywel! It really inspires me to do more carving,especially with burl wood. I hope my own bowl turns out as half as good. That’s absolutely stunning, Hywel! I just took down an old lightening-struck birch in the backyard, complete with 2 burls. Now, you’ve inspired me. I will give this a try! Just beautiful. Just one question: aren’t trees damaged by removing burls? I really liked your knife sheath design too! One of the best i’ve seen Hywel, Very good job indead!